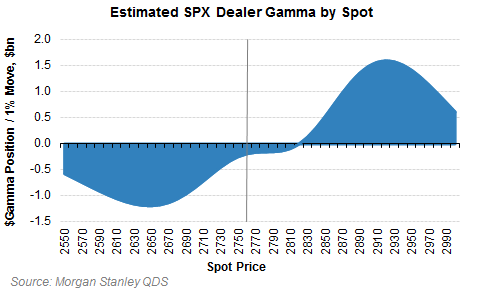 ... were the result of deleveraging unwinds at vol-targeting, systematic funds such as risk-parity, CTAs, and variable annuities as the VIX spiked and key market support levels were breached, accelerated by option gamma hedging as the market continued to sink forcing dealers to sell to delta-hedge. And so the next obvious question was whether the forced selling among the "machines" was over, with JPMorgan's Marko Kolanovic writing on Friday that "CTAs have already executed the bulk of their selling, option hedging risk is now symmetric, and Volatility Targeters will sell over a longer period of time" and "that the majority of systematic selling is behind us (~70%)", while Barclays' strategist Manesh Deshpande, disagreed and predicted "further systematic selling to the tune of ~$130Bn from these funds to reduce allocation to equities over the next couple of days." 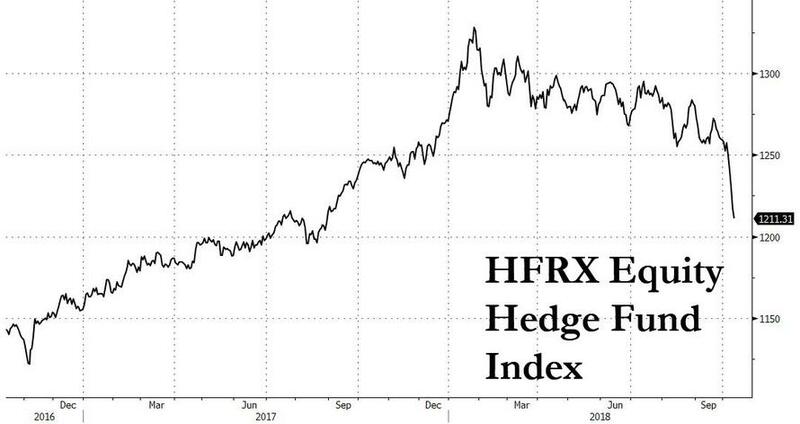 A tie-breaker to both debates emerged late on Friday, when another JPMorgan market strategist, JPMorgan's Nikolaos Panigirtzoglou, author of the popular weekly "Flows and Liquidity" note, suggested that in addition to the usual systematic selling suspects, risk parity funds, traditional Equity Long/Short hedge funds were also responsible for the sharp market downdraft. 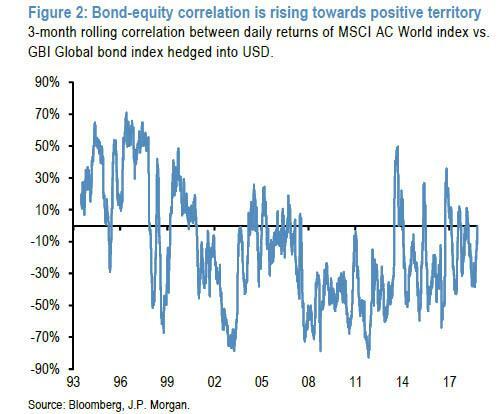 One reason for JPM's assertion, is that these two types of investors benefit from the traditionally negative correlation between bonds and equities "as this negative correlation suppresses the volatility of bond/equity portfolios allowing these investors to apply higher leverage and thus boost their returns." 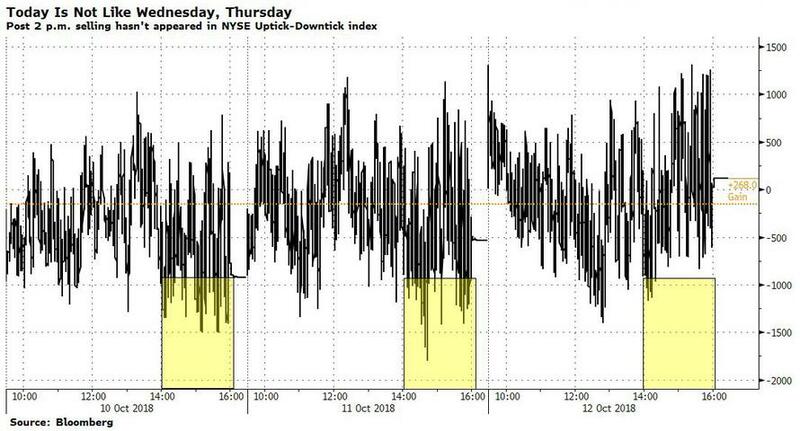 But, as widely discussed in recent days, the opposite takes place when this correlation turns positive, as it did last week, and the volatility of bond/equity portfolios increases, inducing these investors to de-risk. This theory got further support when observing the latest returns of these two fund classes. Reflecting on a piece he had published a month prior, Panigirtzoglou writes that "led by Risk Parity funds, the overall exposure of quantitative funds to US equities looked rather elevated in mid-September and not far from last January's highs" suggesting the risk of a sharp deleveraging; additionally he also notes that similar to Risk Parity funds, the "equity beta of Equity Long/Short hedge funds had risen steeply over the previous two months to a level that was even higher than last January's high." 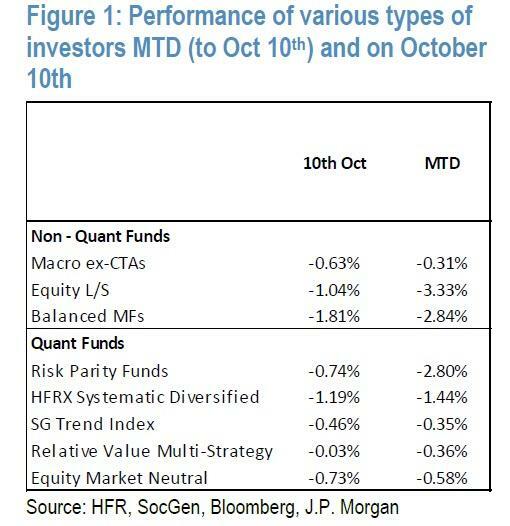 To justify his observations, the JPM strategist then notes that - as one would infer - the worst performing fund categories this month thru October 10th were Equity Long/Short hedge funds (-3.3%) followed by Risk Parity funds (-2.8%) and Balanced mutual funds (-2.8%): precisely the groups that allegedly precipitated last week's drop. ... the next question is whether these two investor classes have finally capitulated. To the JPMorgan strategist, the answer is largely yes. 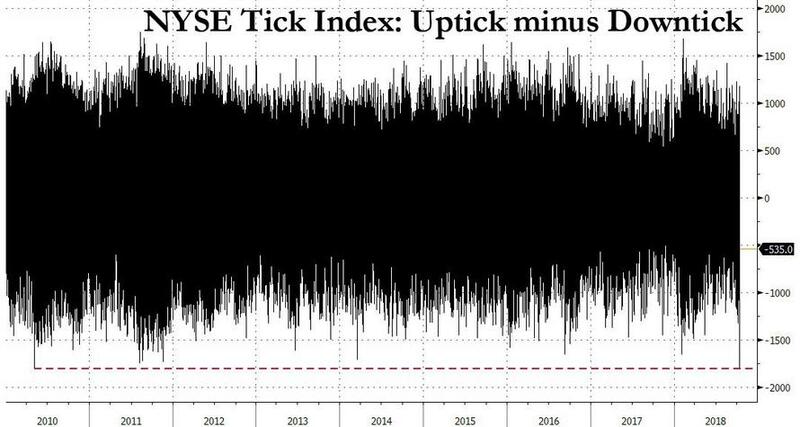 He gets there by looking at the rolling equity beta of both Equity L/S funds as well as Risk Parity funds to the S&P500: "Their implied equity beta collapsed over the past week from the very high levels seen in September suggesting that the deleveraging by these hedge funds is largely behind us." Assuming that Panigirtzoglou is right and the deleveraging by Equity Long/Short, Risk Parity and Balanced mutual funds is largely behind us - something which Barclays disagrees with - does this mean that equity markets are no longer vulnerable? One could argue that these remaining vulnerabilities are both fundamental and investor position related. 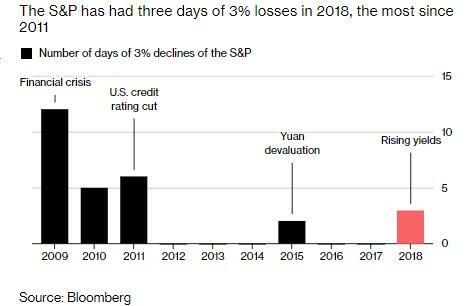 Examples of fundamental vulnerabilities include a potential further escalation of US/China trade war, continued QE unwinding/tightening by G4 central banks, and negative revisions in growth and earnings expectations. 1. 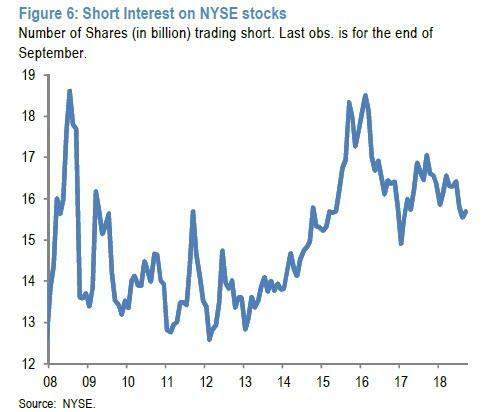 The short interest on NYSE stocks has declined this year, and it looks rather low relative to the past few years’ range. This is shown in Figure 6. Admittedly the last observation in Figure 6 is for the end of September but we doubt that this week's correction has resulted in the emergence of a new large short base in US stocks. 2. Institutional investors look rather under-hedged. 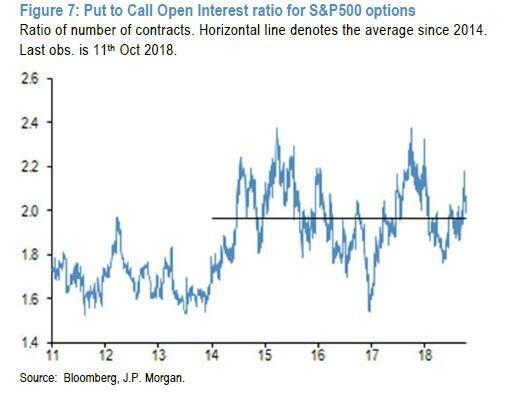 Hedge ratios such as put to call open interest ratios for S&P500 options are either at or below average levels. 3. Institutional investors are still short volatility. 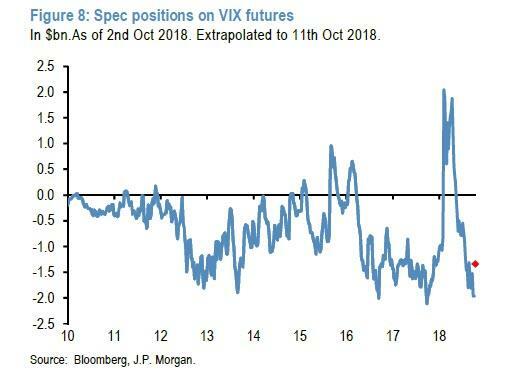 The short base in net spec positions on VIX futures has yet to be completely unwound on our estimates. These estimates denoted with the red dot in Figure 8 are based on an extrapolation of the open interest of VIX futures contracts over the past days. 4. Leveraged US retail investors have yet to unwind the record high leveraged positions in US stocks they had built up until May via their margin accounts. Admittedly the last observation is for the end of August but we doubt that this metric declined enough during September/October to allow us to argue that this source of vulnerability is no longer present. 5. Beyond monthly fluctuations and the natural slowing during this month’s earnings blackout period, the medium term trajectory for repatriation and thus buyback flows is likely to be that of deceleration from here. In particular US Flow of Funds data for Q2 suggest that the repatriation flow slowed considerably in Q2 to $105bn, less than half of the Q1 amount. If this deceleration pattern between Q1 and Q2 continues over the coming quarters, the boost that US repatriation provided to US equity and bond markets via share buybacks and corporate bond redemptions is likely to slow considerably from this quarter onwards. Given that equity indices already experienced comparable declines to February (and e.g. Russell 2000 even a bigger drawdown), we think that the current setup favors buying the dip. 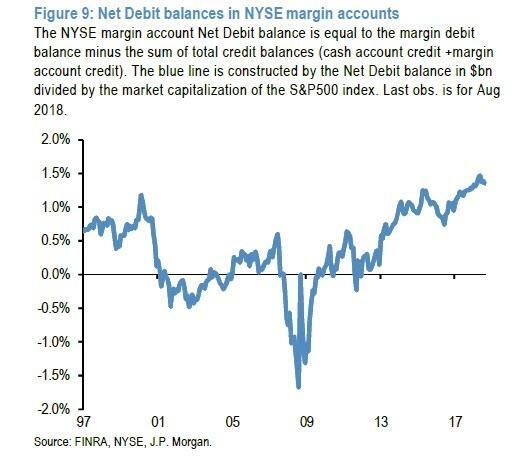 ... JPMorgan strategist #2, Nikolaos Panigirtzoglou, disagrees and cautions that while the initial burst of quant selling may be over, "this does not mean that equity markets are no longer vulnerable" as stocks will now focus on the "remaining vulnerabilities in equity markets beyond those previously emanated from" systematic funds.